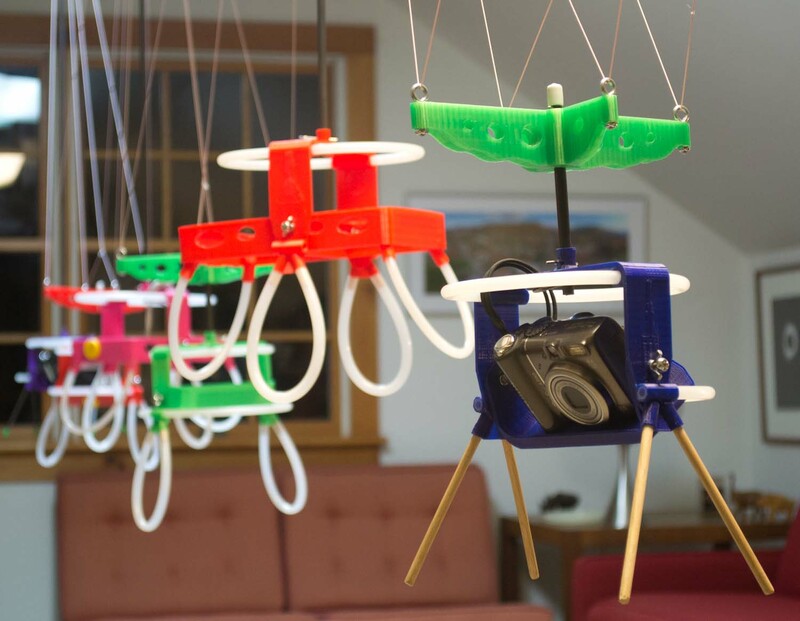 Above: Public Lab's MakerBot 3D printer in Vermont has been busy. 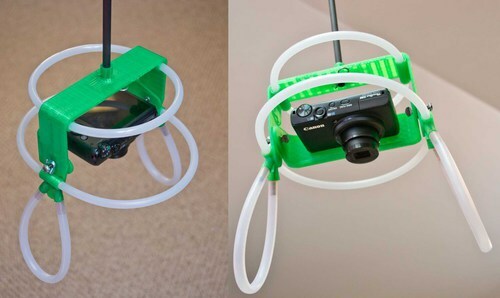 At SNOWFEST I introduced some designs for 3D printed camera rigs for kite and balloon photography. I have been designing these using Sketchup and printing prototypes on one of Public Lab’s MakerBot Replicators. Designs for both single and dual camera rigs are almost ready for release, but both need some final tweaking. I got some good feedback about design modifications from the SNOWFEST crowd. The Redstone Rig, a single camera rig with a Canon S95. The rig is configured for vertical shooting with full bumpers and with a pendulum suspension. 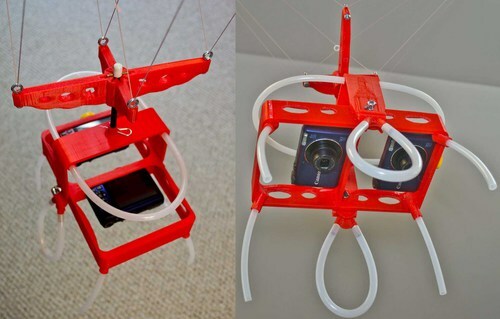 This is an ideal configuration for balloon mapping because 1) the pendulum holds the camera away from the balloon line, 2) the bumpers will not hook the line if the rig swings over to it, and 3) the pendulum prevents spinning of the rig. 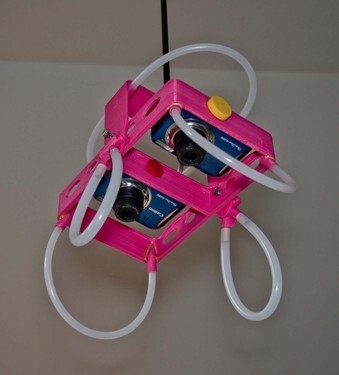 These rigs are intended to be upgrades to the soda bottle rigs that Jeff and Mathew have developed. They lack the soda bottle rig’s most endearing feature -- they are not made from free recycled material -- but they add some important functionality which should produce higher quality results for many people. They are not motorized or remotely controllable, but allow better aerial stability and more camera control and protection. The Redstone Rig, a single camera rig with a Canon A630. The rig is configured for oblique shooting with half of the middle bumper removed and with a Picavet suspension. The Picavet can be locked into eight different positions to aim the camera radially, and the camera tray can be tilted and locked at any angle. This is a good configuration for kite photography. The Picavet and bumpers can be quickly removed for compact transport. The rigs are designed for small point and shoot cameras like Canon Powershots. They allow vertical shooting for mapping and also oblique photography with the camera(s) balanced in either position. Cameras are attached with a thumb screw into the tripod socket and when attached are always securely pointed in the same direction. Protective legs and bumpers can be configured in various ways for different needs. 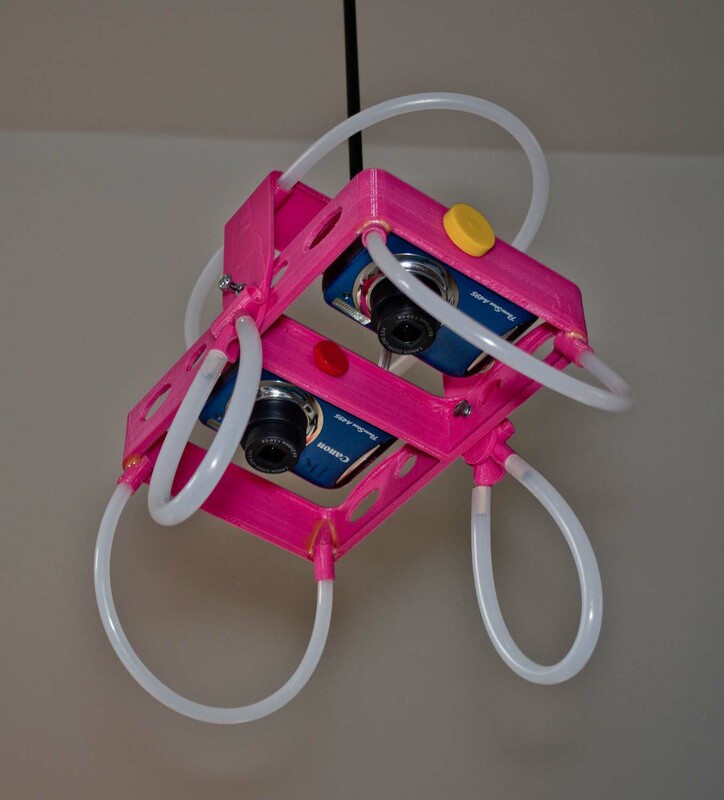 Each rig can be suspended using either a Picavet or pendulum system. The Picavet is recommended for kite flights, and the pendulum is better for ballooning. The Titan 2 rig, a two camera rig with Picavet and Canon A2200s (one is modified for NIR). When attached, the cameras are always pointed in the same direction for maximum overlap of photo pairs. External circuitry for synchronizing shutters can be placed on the shoulders of the hanger. The mass of the cameras is balanced on the hanger connection, and remains balanced if the camera tray is tilted for oblique photography. A pendulum can be used for suspension from a balloon line. The single camera rig weighs two or three times the weight of a soda bottle rig depending on the configuration of legs and bumpers. Fully bumpered, it weighs about 140 grams, while a soda bottle rig is typically 40 to 50 grams. 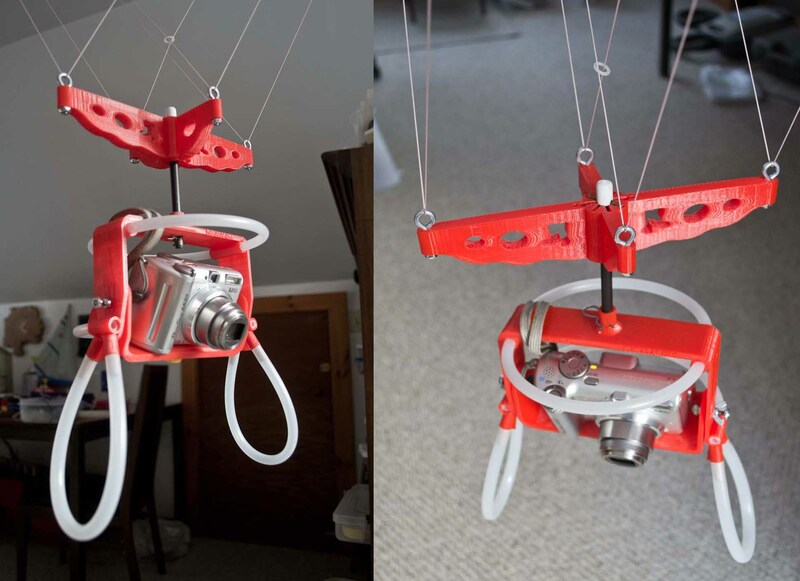 A Picavet suspension system adds another 80 grams, and a pendulum adds about 50 grams. So a rig and suspension system can be five times heavier than a soda bottle rig, although when a 150 gram camera is included, the total weight is about twice that of a soda bottle system (e.g., 370 grams vs. 190 grams). The Titan 2 rig on a pendulum suspension with two Canon A495s. Instead of legs for camera protection, this configuration uses loops of tubing to minimize hooking of the balloon line. As the designs are finalized, the files will be made available for anyone to print or have printed. For those printing the parts, I will have hardware kits available with all the other pieces required to make a rig fly, although most of the pieces are available at hardware stores. I will also make a limited number of complete rigs or rig kits available for those without access to a 3D printer. I hope to have everything ready to distribute in the next several weeks. Display in the SNOWFEST 3D KAP Lab. Foreground: Canon A590 on a Redstone Rig configured for oblique KAP with oak legs. These look great and I look forward to giving them a go!!! Have you tested them at all yet? Im curious how durable are they compared to the soda bottle? Great work! These rigs are not nearly as indestructible as a soda bottle rig. The leg brackets are vulnerable to cracking when the legs are stressed, so I just printed a prototype without leg brackets. A pair of separate leg brackets will be bolted on. That bracket will be stronger, so it will work better. This approach also makes the upper frame much easier to print (almost no support is needed), which is an important consideration for wide distribution. Although the final product will not be unbreakable, it will protect the camera very well even if damage is done to the rig on a hard landing. 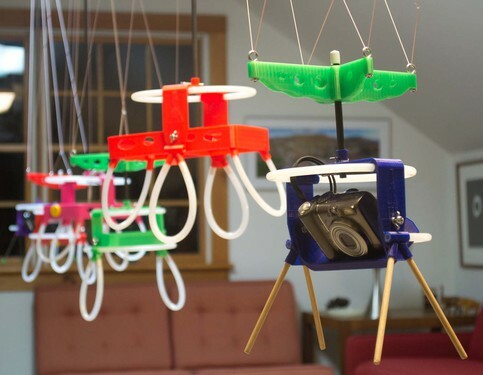 I have not flown one of these yet, but I look forward to that after two full months of prototyping. I love these. Especially the PE tubing bumpers. stroke of brilliance there, chris.